When anybody hears or sees the word ‘free’ they get excited and expectant. With just cause, of course! Everything is SO expensive and therefore so unobtainable for the mere man on the street. Even if you have money to spare and have no need to watch the pennies, a free object or free service of any sort is a welcome concept. People love to get something for nothing. ‘Free’ often has hidden costs and murky surprises lurking around its edges but when we say free fax to email, we mean just that! There are no hidden expenses for the sender to a fax number online because the owner of the line pays for services rendered. You can send as many as you want and you will not pay a penny! 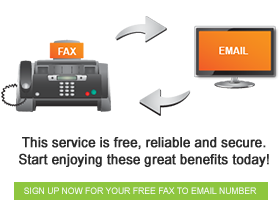 Faxing a document on an ordinary fax machine will cost money- the same as making a telephone call. Nowadays, we have call share or toll free numbers and, as you see, we also have free fax to email. Send your fax and don’t pay anything and the receiver sits at his or her computer and reads it as soon as it reaches the inbox. There is no more running from desk to printer and vice versa. Isn’t technology just too brilliant for words! Imagine sending messages in the future. You will probably have a dongle to plug into your ear and you will need only to think you message across cyber space. The recipient will have another sort of doodah to plug into his ear to listen to your words and should he want to print it, all he need do is press a button on his collar and the hard copy will come out of his mouth. Until this happens, we must rely on internet faxing but watch this space.